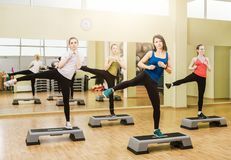 Is an aerobic activity allowing you to improve cardiovascular fitness whilst toning the lower body by using a stepping platform to perform combinations. During Step Power, the low impact and high energy means fat is burnt fast, so ensure you wear comfortable shoes and bring water! It works very well to combine this class with another to enhance your fitness levels quicker, and reach the goals you desire!